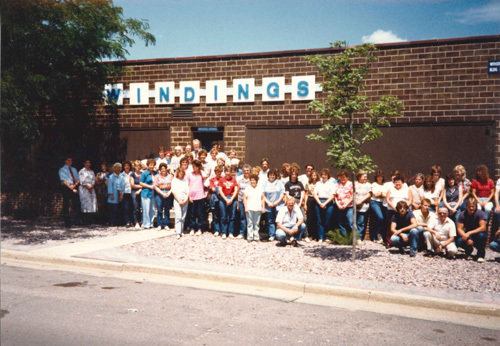 Windings Inc. was established in New Ulm, MN in 1965 by J.W. McKinney to satisfy unmet local demand for synchro motors to drive flap actuators used on commercial airplanes. Under McKinney’s leadership and direction the company grew and prospered, engineering solutions for additional critical applications within the aerospace industry including fuel pump motors and onboard generators. Upon McKinney’s retirement in 1983 the company was sold to Roger Ryberg. In the mid-90s Ryberg directed the expansion into adjacent industries including Medical Devices with mirco-motors for hand-held surgical tools and Oil & Gas with motors designed to handle the extreme heat and pressure of downhole tooling. Additional expansion into Factory Automation occurred in 1998 with the acquisition of a family of low inertia brushed DC slot-less motors used primarily for chip placement in the Semi-Conductor industry, and into Automotive in the early 2000s when the company landed several major design contracts with key global automotive manufacturers to develop motor and generator designs for the emerging hybrid electric vehicle market. To accommodate the company’s continued growth, the New Ulm facility was enlarged and upgraded for added operations in 1989, 1991, 2005 and 2014, and currently encompasses 75,000 square feet of production space. In 1998, as part of Ryberg’s retirement strategy, Windings Inc. formed an Employee Stock Ownership Plan (ESOP) for a planned purchase and transition of Company stock to the Windings employees. Ryberg retired in 2006, and by 2008 the company became 100-percent employee-owned. The higher sense of responsibility that comes with employee ownership has made Windings even more responsive to customer needs and continues to foster innovation along with a desire to bring ever-increasing value.